Do you want to boost attendance for your next open house? Have you thought about using Facebook Messenger ads to engage prospects? This is a great way to get the conversation started with potential buyers. Social Media Marketing is all about creating relationships with your potential audiences. With a messenger ad, you can get the conversation started immediately and answer any questions your potential buyers may have and get them excited about attending one your open houses. Messenger ads provide a personal experience for customers and prospect while providing them instant access to contact you with any questions! 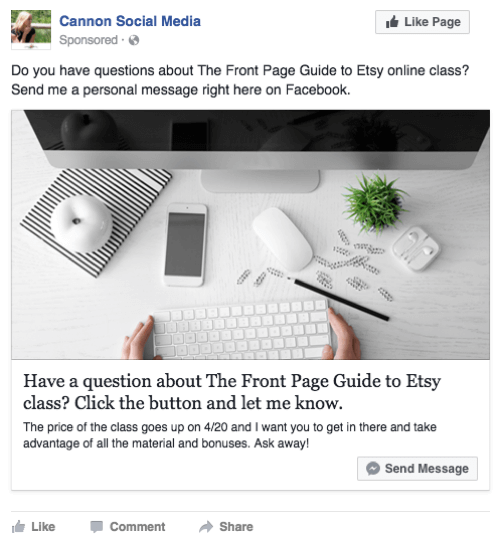 In this article, you’ll discover how to create a Facebook Messenger ad. A Messenger ad is a Facebook news feed ad that opens inside the Messenger app when users click the call-to-action (CTA) button. The ad will let users jump inside your Facebook page’s Messenger tab to ask you a question, get feedback, or claim a reward. Messenger ads look similar to a typical ad in the desktop news feed. The ad below uses the Send Message CTA button, but you could use any of the CTA options, like Contact Us. The Messenger icon will appear next to any CTA button you choose. The Messenger symbol appears next to your chosen CTA button. Because Messenger ads are high touch, the best way to use them is when there’s a short window of time where people can message you. For instance, if you’re launching a new product but the cart is closing soon, run a Messenger ad and ask if anyone has questions. Target your ad to people who landed on your website but did not fill out the form to contact you or get more information. You could also run a Messenger ad when new programs become available or are going away or the price is going up for a listing. Use the ad to urge potential customers to take action because the programs are ending or the price is rising. This type of ad works perfectly with a scarcity model and tight timeframe. Here’s how to get started. Before you place a Messenger ad, you’ll want to create a custom audience of the people you want to target. For example, you could include people who have landed on your promotion/landing page from previous Facebook ads or social shares but didn’t opt in or purchase. To create a custom audience, head to Ads Manager and go to the Audiences section (choose All Tools > Audiences). 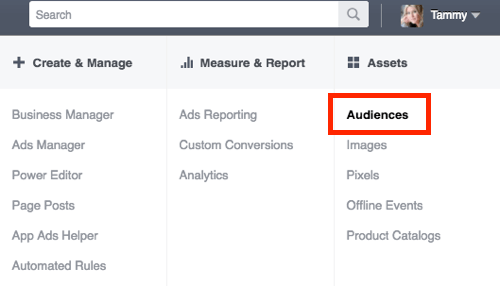 Go to the Audiences section of Facebook Ads Manager. Then click Create Audience and choose Custom Audience from the drop-down menu. 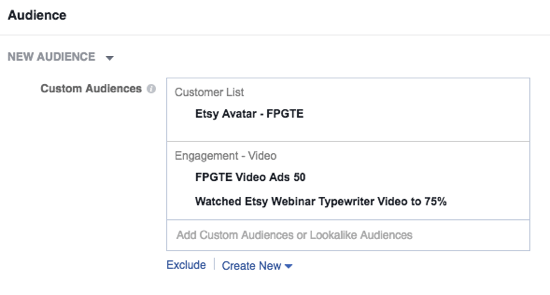 Click the option to create a Facebook custom audience. You have four options for creating your custom audience. You can upload a customer file or create a list of people who viewed your website, use your app, or engage with your content on Facebook. 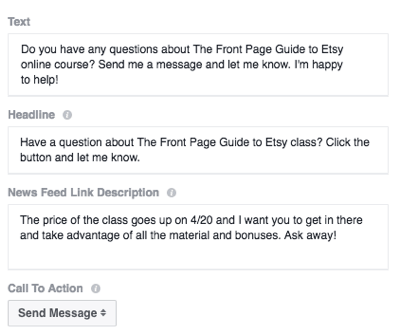 Choose the source you want to use for your Facebook custom audience. Suppose you want to create a custom audience of people who are on your email list but haven’t reached out to make contact with you yet. To create this audience, choose the Customer File option and upload a list of emails from the people who are on the list. You can then retarget this audience with a Messenger ad, letting them know that the listing is increasing in price, or the open house is this Saturday, for example. You might also want to create a custom audience of people who engaged with videos but didn’t contact you or request more information. You can target both custom audiences with your ads. It’s up to you. Now you’re ready to set up your campaign. Go to Power Editor and click Create Campaign. Click Create Campaign in Power Editor. Select the Traffic campaign objective. Messenger ads are “destination” ads (as you’ll see later on), but rather than sending people outside of Facebook, you’ll be sending them right to your Messenger inbox. 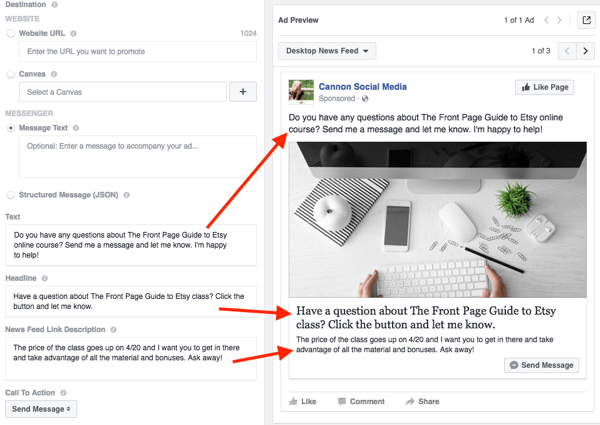 Choose the Traffic campaign objective for your Facebook Messenger ad. 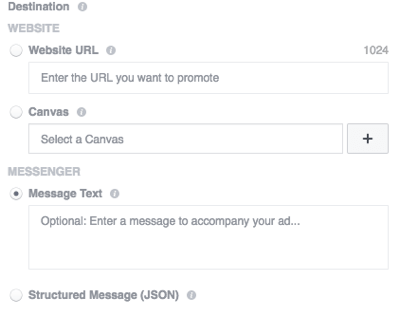 Next, give your ad set a name and make sure the Website or Messenger option is selected. Choose the Website or Messenger option under Traffic. Now set your budget and select your custom audience. For example, I selected a group of people who watched a webinar and engaged with videos on the webinar topic but didn’t purchase the master class. 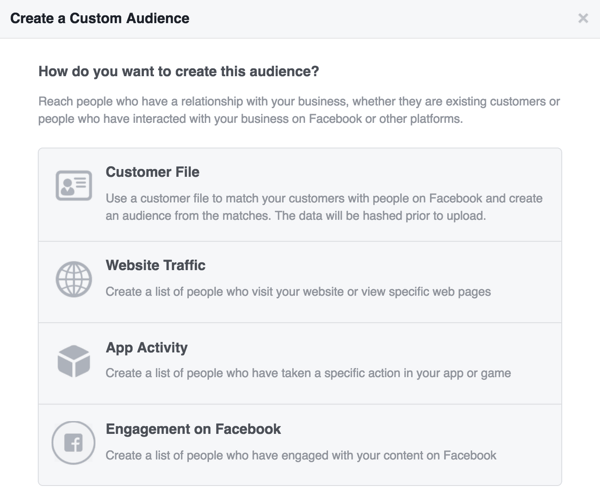 Select your Facebook custom audience and set your budget. From here, fill out the ad set as you normally would. Under Placement, uncheck all placements except the news feeds. Note that Messenger ads don’t work with Instagram. 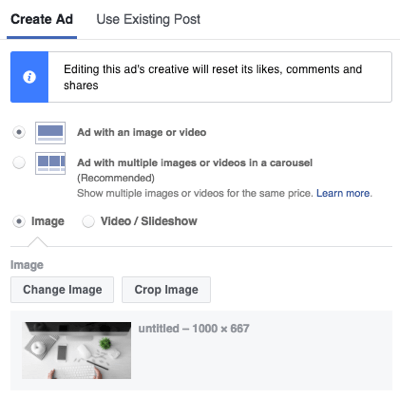 After you give your ad a name and connect it to your Facebook page, head to the Create Ad section inside Power Editor. First, choose the option for a single image or video or for multiple images or videos in a carousel. Then upload your media. Choose the format of your Facebook Messenger ad. Message text will appear in Messenger along with your ad when users click the CTA button. The example below shows what an ad looks like inside the Messenger app after someone clicks it. 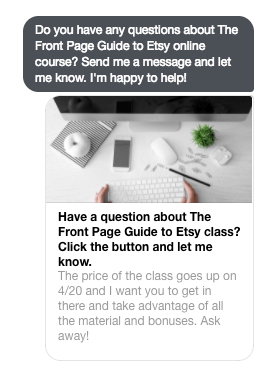 For this ad, I entered the same copy in the Text and Messenger Text fields when creating the ad. This is what the ad looks like in the Messenger app. Filling out the Message Text field can be beneficial to remind people who have responded to your Messenger ad. Closer to the open house, you could send another message to them without having to run another ad. The ad image would remind them they’ve interacted previously. Powerful! The rest of the ad creation process is similar to a regular ad. Fill in the Text, Headline, and News Feed Link Description fields as you would for a regular ad. Additionally, make a selection from the Call to Action drop-down list. Enter the text, headline, and news feed link description for your Messenger ad. When you’re finished, review your ad and then click Place Order. Preview your Messenger ad and when you’re happy with it, click Place Order. Once your ad is up and running, you’ll get notified as soon as someone sends you a message and you’ll be able to respond in real time. When users click the CTA in a regular news feed ad, they’re sent to a landing page to register for a webinar, download a freebie, or even purchase a product. With a Messenger ad, clicking the CTA opens a thread in Messenger, where they can start a conversation with you. This gives you the opportunity to answer their questions, develop a relationship, and potentially generate more potential buyers to show up at your open houses. This article was written by Tammy Cannon and adapted from the Social Media Examiner. Click here to view the original article. Getting exposure for your brand, generating leads and tracking the success of your efforts are the keys to business growth. This morning at the third annual Premier Agent® Forum, an event that brings together thousands of top Premier Agents for two days of networking and learning, Chief Business Officer Greg Schwartz announced the launch of two new products to increase your reach to highly qualified buyers and sellers: Seller Boost and Premier Agent Direct. 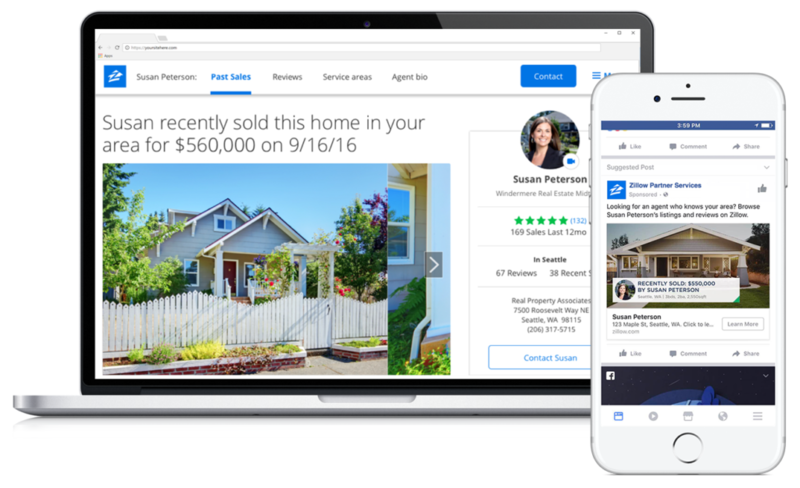 Seller Boost is a new program that connects Premier Agents with highly qualified seller leads: homeowners who have indicated they are looking to sell and chose to contact an agent on Zillow or Trulia. The program is an add-on to your existing Premier Agent advertising; when you participate in Seller Boost, listing leads appear in your Premier Agent Inbox alongside your buyer leads, and they are clearly identified so that you can see at a glance what kind of leads you’re receiving. Listings leads from active sellers are highly valuable: They can keep your sales funnel full and offer the potential of doing more than one transaction with the same client. Seller Boost effortlessly provides you with leads from real, high-quality sellers, helping you increase your exposure and outreach to home sellers to grow your business. Seller Boost is an exclusive offer that’s available to a limited number of agents in each market. For more information or to see if your ZIP codes are available for Seller Boost, contact your Zillow business consultant. Premier Agent Direct is a new brand advertising platform that allows agents to work their farm area more efficiently. The platform extends the audience for agent brand advertising across Zillow and Facebook, providing sophisticated, targeted exposure to high-intent home shoppers. Premier Agent Direct uses your Zillow Group profile information, such as a profile photo, listing photos and team branding, to automatically create and rotate two types of ads on Facebook:ads that feature your recently listed properties and ads that highlight your recently sold properties. Using Precision Targeting technology that displays agent advertising to the home shoppers who are likely to buy or sell in your target ZIP codes, Premier Agent Direct optimizes the ads to make them personal, memorable and relevant. When the targeted audience clicks on the Facebook ads, they are directed to a branded landing page on Zillow that allows them to connect with you. If there are no recently sold homes or new listings to showcase, an ad highlighting your brand will run in place of the other ad types until you have a new sale or listing. Premier Agent Direct also provides agents with rich brand advertising on their agent profile and in home search results, email nurtures and more across Zillow on desktop and mobile. Unlike general Facebook advertising, Premier Agent Direct uses Precision Targeting to give you exposure to the unique and high-intent audience of users who are actively shopping for homes on Zillow or Trulia. When they click on your ads on Facebook, they’ll be directed back to a landing page on Zillow that features you. 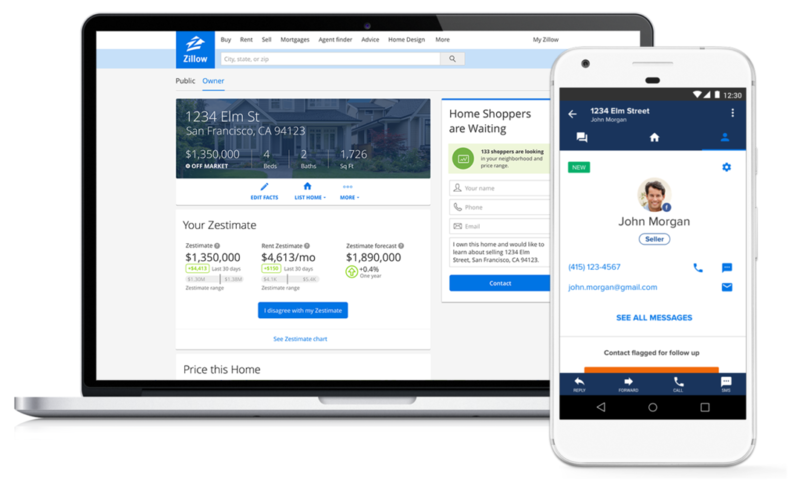 Leveraging Premier Agent Direct ads is effortless on your part: Zillow Group creates, manages and rotates your ads, so you don’t need to do any additional work to ensure that relevant, timely advertising appears to buyers and sellers in your market. It’s vital for the success of your business to have transparency into the impact of your marketing tactics and flexibility to make changes that garner the most bang for your buck. Premier Agent Direct ads pinpoint the right buyer at the right time in the right place. Leads appear in your Premier Agent Inbox just like any other lead, and you receive monthly reporting by email to help you assess the reach of your brand advertising across our publisher network. Premier Agent Direct will launch broadly in 2017, so stay tuned for updates! To put yourself on the waiting list to be one of the first to have access to this new platform, click here. Do you use Instagram to market your real estate business? If not, start taking your marketing to the next level by running Instagram ads! Instagram advertising gives real estate brands an effective way to increase visibility and connect with their customer and prospects. In this article you’ll discover how to create these ads for your blossoming real estate business. Before you can start advertising on Instagram, you need to connect your Instagram account to your Facebook page. 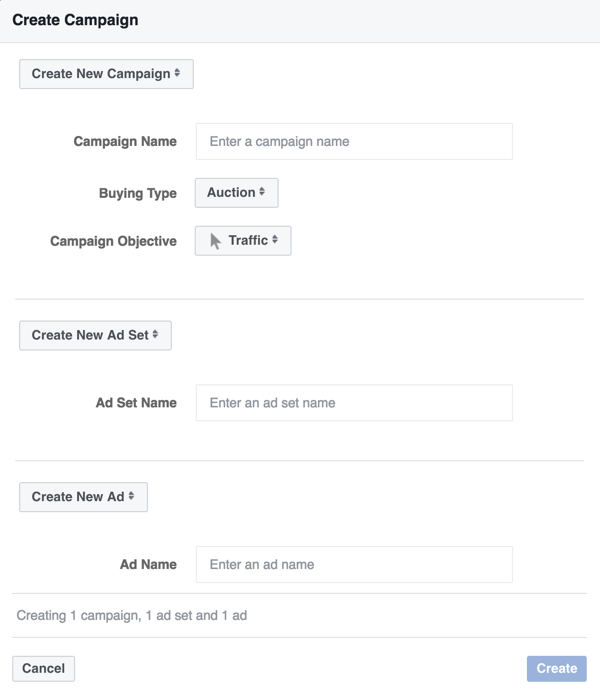 By doing this, you can create your ads in Facebook Power Editor. Go to your Facebook page and click Settings in the top-right corner. In the left column, click Instagram Ads. Click the Add an Account button on the right. Go to Instagram Ads in your Facebook page settings. If you have an existing Instagram account, select Add an Existing Account. Enter your Instagram username and password and click Confirm. If you don’t have the ability to edit and create Instagram ads just yet, fret not. You will soon, as Facebook and Instagram are still rolling out this feature. For Instagram ads, you can choose from three advertising objectives: clicks to your website, mobile app installs and video views (videos may last up to 30 seconds in length). Within these objectives, there are three key ad types that you can capitalize on. These are image, video and carousel ads. Image ads are standard photos with a button driving users to click. Video ads are the same as image ads but with video. Carousel ads are a series of images that users can browse. Carousel ads let brands tell a richer story in one ad unit. All of these ad options can drive results depending on what you want to accomplish with your real estate advertising. If you create an ad for a specific audience, you need to make sure that it will be seen by only that audience. For example, if you create a real estate themed ad geared toward working moms, you don’t want it to be shown to high school students or stay-at-home dads. Leverage the targeting features on Instagram to accomplish this. For those experienced with Facebook ad targeting options, the majority of these tools are also available for Instagram ads. These include location, demographics, interests, actions and more. Set your audience preferences to best utilize your advertising dollars. Keep in mind that you don’t have to use all of the targeting options available to you. Use the targeting options if you want more control over who sees your ads, so you can ensure you’re delivering a marketing message that will appeal to them. Instagram is known for its rich and attractive images. If you want to create Instagram ads that drive results, take the time to design irresistible visuals to catch people’s attention. Remember that the audience on Instagram is savvy enough to recognize stock photos, and that they will be less likely to engage with that type of content. Capture photos yourself or invest in a photographer/illustrator to create great content for your advertising. With Instagram ads, currently there are no stipulations about the amount of text you can have in a photo, unlike other social networks. This gives you the perfect opportunity to create ads that are text-heavy and communicate stories. You can also include calls to action directly in your photos or video. Whether you tell your audience to post a selfie, click a link, subscribe to a newsletter or tag a friend in the comments, being able to use as much text as you want in your visual gives you an opportunity to drive action more effectively. From #ThrowbackThursday to #MotivationMonday, Instagram is filled with hashtags that are used by both broad and targeted audiences. This gives you an opportunity to inject your real estate brand into the feeds of people using these hashtags and make a connection with them. One popular hashtag on Instagram is #ThingsOrganizedNeatly. Users post photos like these. With the emergence of Instagram ads, you can build a rapport with your prospective audience in a whole new way. Once you attract an audience with your real estate ads, it’s important to keep your followers engaged. With the right approach to Instagram marketing, you can drive great results for your brand and truly stand out from your competition. If you need help setting up your Instagram for advertising, CLG Marketing Team can help! Contact us today for your free consultation! This article was written by Josh Fraser, Marketing Specialist at HomaASAP. Article and photos attained from Social Agent Today.